If you’ve ever had to change a lock, you know what a hassle it can be. Now the Matrix Key System means you’ll never have to call a locksmith again. Designed by Australian locksmith Stuart Webb, this amazing system disables any lost or stolen keys and can be adapted to any type of lock, including doors, garages and padlocks. It also eliminates the ability to “bump” or jimmy your lock, giving you added security. The bottom line is that to change the lock, you only need to insert a new key into this system and it’s done. Standard locks use pin tumblers of different lengths placed inside narrow chambers. Insert the correct key and the pins align, which allows the barrel to turn and the lock to open. Webb’s Matrix system lets the length of the pins change when you insert a new key. Each lock sold in this system comes with a series of keys – usually between six and twelve. Want to change the lock? Just grab the next key in the series, insert it into the lock, and viola! You’ve now got a new lock! How easy is that? More info and video here. * Standard design – it had to be compatible with existing locks and cylinders already in the marketplace. * Bump-proof – lock-bumping is causing chaos in the Americas and has the same potential in the UK. Following the airing of a segment on a nationally televised television program in Australia, the fallout in the hotel industry has been significant. 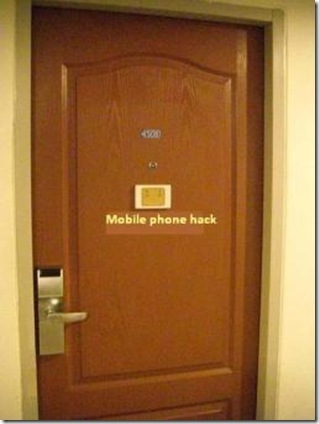 It seems that a particular video, detailing how a simple hack, requiring no special tools or materials, can be applied to many of the existing hotel room door locks in use throughout the world. The hotel industry is particularly concerned about the security of it's guests with many leading hotels (and others) scrambling to mitigate the potential security breach and damages that this revelation has highlighted. The video of the segment has apparently been taken down for fear of widespread security breaches, but essentially the hack involves an already pre-programmed room card, when inserted into another (different) room door lock and a mobile telephone held close to the door lock, the pressing of any keypad button, apparently allows a magnetic induction signal to emit from the phone, tricking the particular lock into thinking the keycard inserted is the correct programmed key. Electronic security products are all the rage today, but are constantly being found wanting in the quality and suggested security they are being designed or used for. While I agree that electronic security products certainly have their place in modern security environments, the time tested mechanical security product will continue to serve us because of it's ability to continually do what it is designed to do without the reliance on electricity. An alternative to the brand name products, K2 manufacture excellent quality, pure form and function products, tailored to many and varied requests. Owned by Stanley, Black & Decker, their range of commercial hardware alternatives are being used in increasing quantities all across the country. I have personally installed some of their products and the customer satisfaction is among the highest rates of products I have used recently. The competitive pricing significantly positions K2 as a leading contender to the Big Brand Name products. The QCI200 series interconnected levers are designed for multifamily, assisted living, commercial & mixed use applications where single motion egress is required. These leversets deliver premium performance and are designed to withstand the physical abuses of the applied environment. Strikes – "T" strike 11/8" x 2 3/4" standard for lever, deadbolt strike 11/8" x 23/4" standard. Other strike options also available. Offered with the following keyway options: KW-Kwikset, WE-Weiser, SC-Schlage, GA-Yale, LA-Sargent, BF-Best "F" & LC-Less Cylinder. More from CISA. The CS9580 Magnetic Lock system is a product designed for hotel's primarily, but can be used in multi-level buildings requiring secured access control, easily managed internally. Vertical auto-cleaning reader prevents dust accumulation and damage typically caused by insertion of coins, needles... and other objects. The design and position of the reader conforms to standard door preparation which preserves fire rating and acoustic performance. Powered for up to 3 years by only four standard alkaline AA LR6 1.5 V batteries. Does not require use of proprietary battery packs. User friendly and easy maintenance. In the antipanic lock the deadbolt is automatically thrown when door is closed for added security. (Standard mortise also available). The lock memorizes the last 300 operations including the use of the mechanical override. The print out shows all the details of the card, guests or staff name included!!! (Not only a card number). No need for low-security drill points!!! side Bitting System cylinder (patented). A series of 3 Master Keys with special TSP keyway (patented). Security Card for authorisation and safe key and/ or cylinder duplication. Usage recorded in the Audit Trail. Possibility to have the same master key system for both locks and guestroom safes. This technology provides the most accurate time and date stamp for card validity and audit trail reporting. (No sequencing problems). By using RAM technology, the most advanced technology available for electronic locks, the locks can be upgraded at any time. This is the built-in guarantee that your lock system will be new for many years. Special electrochemical treatment to withstand demanding environmental conditions, such as in resorts and in cruise ships. Elimination of PC gives higher security and reliability. Network manager (built-in) and fault tolerant configuration available. All systems come enabled for Property Management System and Point of Sale Interfaces. (No need of auxiliary devices). No master keycard levels limitations!!! Each staff keycard is customized to their unique requirements. Cancel invalid guest cards by remote (thanks to the on-line special access control). Eliminate the risks of double booking guests. Up to 10,000 rooms within a single system. Ergonomically designed to optimize the space at the reception. Our on-line special access control cancel invalid guest cards at check-out not just on expiry, providing greatly enhanced security for perimeter doors, car parks, guest elevators, etc. (Off-line version also available). I realize the picture is not of great quality, but that should not detract from the benefits of this product. The Italian styling and engineering of this sensational product, especially designed for hotels, cruise ships etc and environments prone to extreme weather conditions. The CISA CS 9800 Smart Lock is the culmination of significant research and development through consultation with the end user. Are you aware that Safety and Security are 2 of the major requirements for guests when selecting hotels of choice? Living in an almost completely digital and cashless society, travellers, business people and tourists are much more technologically savvy today thanks to the internet which has increase electronic communications, reservations, payments etc. Many of these market segments appreciate forward thinking manufacturers that produce products like these aimed at reducing down time, increasing efficiency, safety, security and at the same time lowering cost and inconvenience. The CISA CS9800 Smart Card system is one of the first products on the market that is completely unable to be operated by cloneable smart cards. This means that your swipe card is unable to be surreptitiously duplicated, by those intent on fraudulent activity. As a hotel owner, there are many cases where a guest has attempted to defraud the hotel claiming use of cloneable cards and receiving discounted (sometimes refunded) invoices, free accomodations, false claims of theft etc. With CISA CS9800 Smart Card System, this is no longer tenable, as only original system cards programmed onsite and by an authorised staff member can work in the system. Designed to manage the access to restricted areas (parking, swimming pool, garage, etc.) or where the lock could not fit with the existing frame. Powered with 3DES engine, card clones are kept out from the property thanks to the authentication process! We are currently reconsidering our decision to not make car keys. Having seen the demonstration of the above 3D Pro duplicator/originator key cutting machine, we are almost convinced that, with this top of the range machine, we will be able to compete effectively in the market place. The 3D Pro is the culmination of significant research and development by some rather talented locksmiths. They set out to create a machine designed to duplicate/originate most of the current crop of keys in the market. As the above video shows, the required steps and equipment, has been made much simpler. It is certainly a heavy investment, however we believe that with this machine, we will be able to offer our customers competitive priced alternatives to other key makers. NOTE: This is only one step in the process of making high security auto keys. There is also the requirement for additional transponder programming equipment, to enable the correct key (after being made) to be programmed to the specific vehicle. The 3D Pro has been especially designed to handle not only car keys, but also common house keys too. The prime difference between this machine and other machines on the market, is in it's ability to correctly determine the factory specifications of even a worn key, then re-create the key to the original factory specifications. You are then presented with a new original key, instead of a duplicate. Our decision to invest in this machinery is not ratified just yet, because we are also determining the most appropriate transponder programming equipment we will need to be able to offer a wide range of auto key manufacturing requests. The decision to enter the automotive key manufacturing market is not an easy one. The requirement to invest significantly in inventory (to the tune of about $50,000.00 per year), means a huge investment for a small business like ours. My training as a locksmith involved many years of "cutting my teeth" in automotive lock repairs. Many of my first 20 years in this business, were spent developing the auto locksmithing skills. I am looking forward to offering these services in the near future. - resistance to side load on deadbolt to 2.000 kg, 6 times more than the performance of the best locks on the market to date. Elettrika is an electric lock which suits any type of door or gate in terms of style and size. Its evolved design and its essential curvy lines offer an extra resource for architects style research. it is equipped with self adjusting device for closure, both horizontally and vertically. 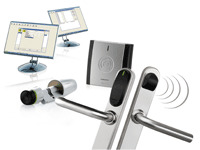 Last year we wrote about SALTO access control systems. We update this information with some of their latest introductions. Imagine being able to control all the doors in a building from one central location with just the click of a mouse. Imagine being able to monitor your access network, delete key cards and download audit trail information all in real-time. Imagine being able to do all of this without wires. SALTO was the first company to develop electronic access control without the need for expensive hard wiring with their SALTO Virtual Network data on card technology. Now, in response to market needs, they’re introducing the SALTO real-time battery powered wireless system. SALTO wireless system is an on-line real-time battery powered access control system that uses radio frequency technology to communicate in real-time with the central computer. locks and even narrow profile doors. The SALTO escutcheons are compatible with Mifare, Mifare plus, DESfire, DESfire EV1, Picopass, iClass and Skidata and NFC.So you can use existing RFID cards, reducing start up costs, and minimizing system commissioning issues. The SALTO escutcheon is intelligent and takes the decision to grant or deny access based on the users rights. The answer is immediate with no communication needed with the server or controllers, avoiding possible network problems and no emergency master key needed. In case of network failure, access is granted through SALTO Virtual Network technology without compromising security or the user’s access rights. The SALTO wireless system combines the efficiency of both on-line and off-line applications in a single system. Real-time communication with state-of-the-art SALTO stand alone battery powered escutcheons simplifies security management and provides unrivalled levels of access control flexibility. It uses AES128 bits encrypted radio frequency communication based on IEEE 802.15.4 at 2,4Ghz to transfer information from escutcheons to the PC through strategically located gateways or repeaters. The wireless system is so efficient that battery power consumption is close to that of our standard battery powered electronic escutcheons. Real time audit trail: View door access in real time without having to visit the door. Real time door control: view door status in real time. Real time battery control: Monitor battery maintenance by viewing the lock battery status in real time. Key management: Resolved in real time as the locks receive cancelled key updates as soon as they are generated. Any number of doors can be equipped with the SALTO wireless system at much lower cost than a conventional wired access control solution. Gateways and repeaters act as antennas, collecting and sending information from the PC to the stand alone wireless locks. One gateway can manage several repeaters and electronic escutcheons, minimizing infrastructure costs and maximizing flexibility. The SALTO wireless system is compatible with most common RFID technologies including Mifare/DESfire, Inside Picopass, Legic and HID iClass. This makes integration easy and in most cases you can continue using your existing cards for all your applications. 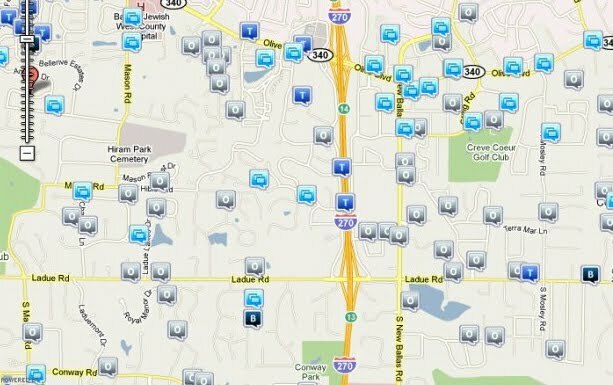 I reside in the town of Creve Coeur, MO. My town, like most other regions across the country is not immune to crime. This month we report the latest statistics reported by the Creve Coeur Police Department. We display the incidents listed above. This does not include all incidents, but just an example of the types and quantities of incidents requiring police attendance. The surprising high quantity of alarm calls includes fire alarms and burglar alarms. Many of these incidents may include false alarms, but this indicates that either the alarm systems may be faulty or people accidentally set off their alarms and did not call their security company to cancel. The police do not attend for nothing. Often there is a significant charge to the resident for police attendance and fire service or emergency service attendance, on top of the already steep taxes we residents pay to these departments. 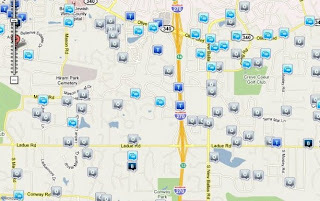 For precise locations of the incidents, click on the source. I recently installed some of these CCTV cameras to a small business intent on securely monitoring their property. Surprisingly inexpensive and made from very good quality components, the abilities of this wondrous gizmo are astonishing considering it retails for a little less than $100. 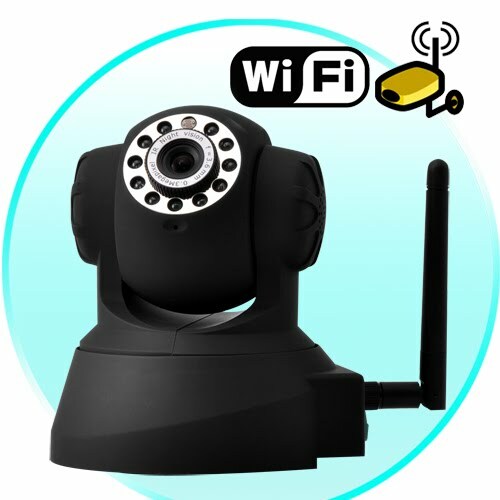 It comes with purposely built software allowing for up to 9 cameras to be viewed on your computer. Each camera maintains it's own IP address, enabling you to use Direct DNS systems to view the content (what it sees) over the internet. It has a limited zoom capability but the pan and tilt functions are superb. It has an ethernet port allowing for wired connections too, apart from WiFi. Sometimes WiFi signals can be interrupted by brick walls and significant cabling and wiring built into the infrastructure of buildings. This is why they have included the ethernet port, to allow for hard wired access too. I am experimenting with PoE (power over ethernet) devices too, which will allow for installing quasi-wireless systems using the existing electricity supply in dwellings. Effectively, PoE might just be the answer to our prayers for enabling wireless control of computer peripherals without necessarily using a wireless router. I must say, I'm fairly impressed by this product and so far my customer seems to be reasonably happy too. I strongly recommend that prospective customers of biometric products, thoroughly investigate and evaluate their decision making prior to purchasing some biometric fingerprint locks. The fault above is common to a number of different manufacturers. There are other bypasses too, but this is one of the more simple ones to understand. When you also consider that fingerprint locks seem to have difficulty scanning the prints of elder people, you might want to reconsider seriously your impetus for purchasing this kind of product. Many of the above style of safes can be found at the big box hardware and department stores, like Walmart, Home Depot, Lowes, K-Mart and Target. These "safes" are marketed as secure but in fact are by no means worthy of being titled "safe". What do you think? Would you purchase something like this to secure your valuables? I hope not! I certainly hope you havent invested in the latest Kwikset Smartkey technology. The problems with this product continue to mount. Baldwin products were recently purchased by the same parent company as Kwikset and have started making their locks and hardware using the same types of cylinders. If you purchase new products from any of these related manufacturers, you need to be aware that the techniques for opening these locks are too easy to duplicate. or Straight Lever when ordering. This product has not been released yet, but it planned for release soon. More information when available. The month of July, 2010 realized 397 direct hits from searches on this website. Just short of our all time monthly record, it shows a definite upward trend in hits from search results. Month over month we show a 27% increase in search query results. Pictured to the left we show the more popular search terms from our analytics. These terms are collected from all the search engines and are the most common searched for terms that lead people to this site. 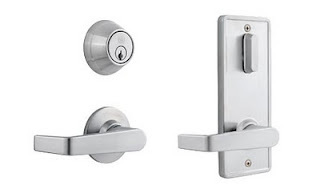 While I am pleasantly surprised at the inclusion of our signature product Bilock into this months list, Pocket door locks with key, continues to post significant gains in popularity. Interesting too is the quantity of searches for Schlage Securekey Problems. We are finding increasing quantities of calls locally for door repairs, especially due to the increased extreme weather conditions experienced this year. These door repairs include warping thresholds, doors dropping, hinges loose etc. Our primary training is in the field of locksmithing, but locksmithing actually is an amalgamation of a number of other specialist trades. Specifically Boilermaker, Fitter and Turner, Welder, Carpenter, Auto Mechanic, Machinist, Lathe Operator, electronics technician, architect. Master keying is a part of the trade that is unique to locksmiths. Many modern day proximity card system manufacturers take their ideas from the advances made by the locksmith industry. If it were not for locksmiths, many of todays quality physical and electronic security products may not have been created. It is because of locksmiths that many of todays security products are scrutinized to determine their viability for market. Consulting your local locksmith should be considered a priority in any decisions about door locks, hardware, security systems, keys, access control and protection for your home, office, colleagues and family. The employment situation, the last couple of years has seen many companies retrenching many employees that hold keys to the office. The regular need to re-key locks often involves replacing all the keys in the office. But what if you could own a system where each individual employee has their own unique original key, different from each other and copy proof. Basically, a low tech approach to access control that minimizes the cost of having to change locks and replace every other employee's key. When you lose that key, you can easily remove it from the system without affecting any other users. New sophisticated low tech solutions are now available. Please email us for details.